Millions of people worldwide united for the Women’s March on Jan. 21. People were at the march not only to support gender equality, but also to support causes such as immigration reform and the Black Lives Matter Movement. Expeditions teachers Noelle Easterday, Aaron Calvert and Lissa Thiele attended the Jan. 21 Women’s March from three different locations: Washington D.C, San Francisco and San Jose. Below are their different stories and perspectives from that day. 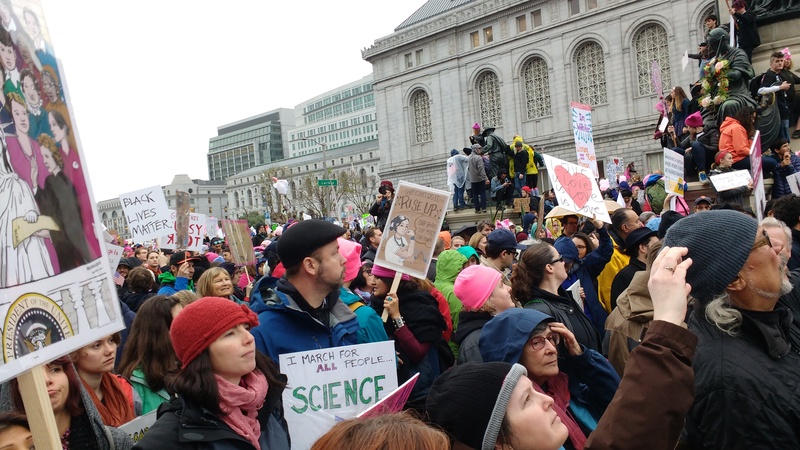 Noelle Easterday, an Anthropology teacher for the Expeditions team, went to the Women’s March in Washington, D.C.
Aaron Calvert, an Entrepreneurship teacher for the Expeditions team, attended the Women’s March in San Francisco. “I attended because I oppose Donald Trump’s policies and rhetoric against minority groups. I support the right of all people to protest against the racist and sexist language that Trump used and believes in. I don’t agree with his hateful vision of what America is,” Mr. Calvert said. Expeditions teacher Noelle Easterday traveled to D.C. for the Women’s March on Jan. 21. A comment: all those concerns listed above are feminist issues, but the article title makes it seems like feminism doesn’t encompass oppression in those forms. It does, and Marchers will continue to work to stop it – day by day.